We now proceed to another pyramid less than a mile of the Bent Pyramid , Which is called the Northern Pyramid of Dahshur . 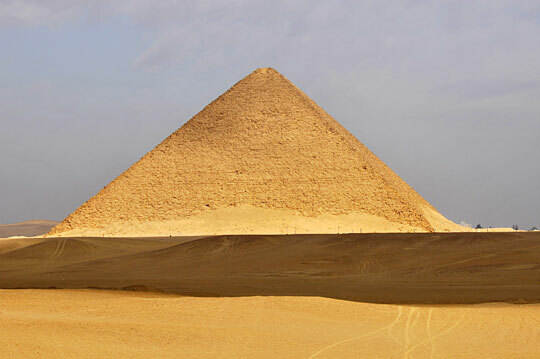 It is popularly known as the Red Pyramid because if the reddish or pinkish tint of the core stones. The Red Pyramid is in good condition . This is the earliest monument which is in complete pyramidical from . It looks good because i still retains large areas of its original casing stones . Who built the Red Pyramid ? Again , there are no inscriptions whatever inside or outside if this pyramid . It is believed that thus pyramid was built during the reign of king Snefru (2575 - 25551B.C). The blocks here are huge ! yes . The height of blocks here vary from 1'-7" (.5m) to 4'-7" (1.4m). What is inside the Red Pyramid ? The entrance passage is again the unique typical polar passage .it leads down a long , sloping corridor , to the bedrock , and is only 3'-11"(1.2m) high . Again , he passage is too small for a person to walk standing up straight . A short passage leads upwards to a third large room, The corbelled roof of this third room rises to a height of 50'(15.2m) . The rooms were empty again ? Yes, Snefru built two , and possibly three colossal pyramids m and erected stone monuments throughout Egypt , It is estimated that nine million tones of stone were used during the Pharaoh;s twenty -four years reign . So Snefru used more stone in building than his famous son Khufu ? Yes , Building with stone occurred on a mush larger scale prior to the building with stone occurred in a much larger scale prior to the building of Khufu's Great Pyramid at Giza . So Snefru was never buried in his pyramid ? there is no evidence of burial in any of the three pyramids . It should be clearer than ever that these Pyramids were not built to entomb anybody.